Catalytic Products International is continuing our 43-year history of providing innovative air pollution control solutions with a line of highly flexible, economical EPA qualified, vaporcombustion systems. CPI’s Thermal Combustor Systems (TCS) routinely exceed all worldwide regulatory requirements while providing a level of sophistication that is unmatched in our industry. In today’s ever-tightening regulatory climate, traditional technologies such as open flares and pit flares cannot achieve consistent high VOC destruction at an economical installed cost. Low cost - High Performance - Long Life are the key advantages of CPI’s Thermal Combustor Systems. 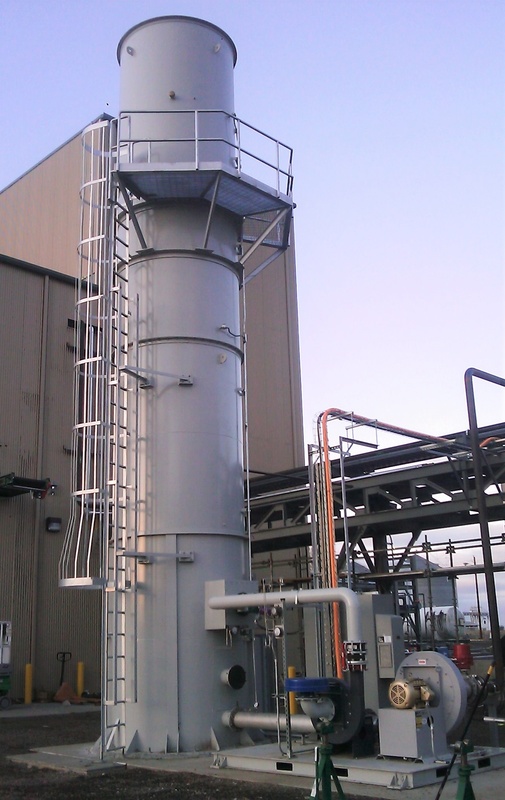 Thermal Combustor Systems are designed to burn safely or combust hydrocarbon vapor mixtures that have varying energy content where enclosed flares may fail. 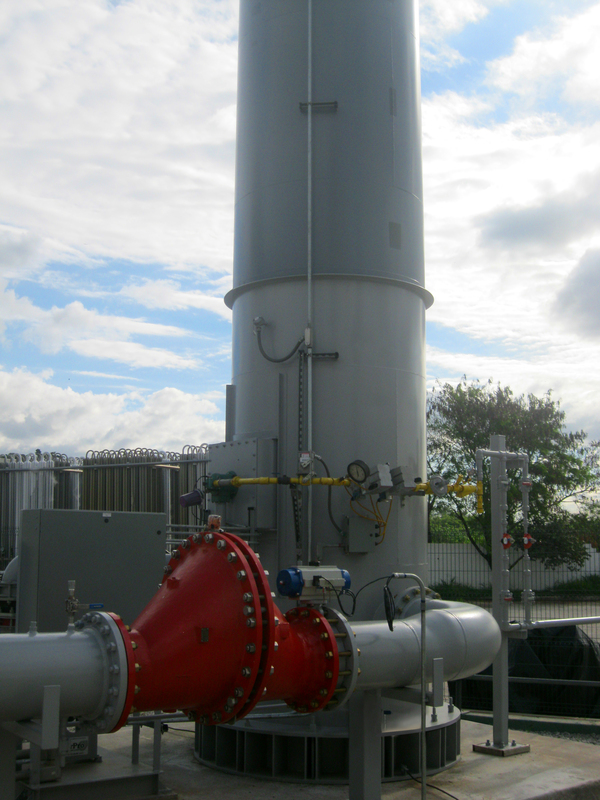 The TCS combines the simplicity of an enclosed flare with the robustness and proven performance of a thermal oxidizer. The TCS are widely flexible and can confidently handle the vent gas that may or may not be within the flammable range. The TCS provides an extraordinary level of safety when compared to traditional flaring systems. Our 43-year history of emissions abatement system design and manufacturing, assure you a safe and reliable system. Thermal Combustor Systems are custom designed for your particular process and can include forced draft or a usually drafted system along with a full complement of auxiliary devices to aid in performance and safety. The TCS operation sequence begins by purging the entire system with fresh air. After purge, the TCS pilot and main burners are ignited and held in place until appropriate flame scanning safeties are met. Once flame safety requirements are met, process gas may be introduced to the TCS. The TCS system will automatically adjust to different volumes, concentrations, and heat values of the process gas. If the process gas does not have the energy to support combustion, natural gas may be added as a support fuel. 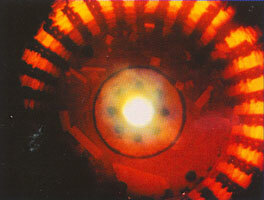 The introduction of process gas will increase the internal temperature within the combustion chamber. To control the temperature and facilitate combustion fresh air is added to the system. The fresh air can be naturally aspirated or forced into the system. The combustion air brought into the system ensures mixing, sufficient oxygen, and controlled temperature combustion providing the optimum VOC destruction efficiency. Sensors in the combustion zone continuously monitor temperature, allowing the PLC to control the heat release from the process gas. For example, as the process gas is introduced, and the combustion temperatures rise, the PLC first reduces support fuel, allowing the process stream to be the main fuel source for the TCS. Once the supporting fuel is removed, it starts to increase the amount of combustion air being used to help maintain temperature. The same also happens in reverse: If the temperature begins to fall, the additional air supplied will be removed and eventually the supporting fuel will be used to maintain the TCS temperature and process ready status. In either scenario hydrocarbon, vapor destruction rates are achieved through a reliable, consistent combustion process. All Thermal Combustor Systems are fully enclosed flare designs that hide the flame while thermally combusting the vapor gas steam. This supports a safe design when compared to exposed flame flare systems and allows installation in numerous areas of any plant. Working with our Process Gas Burner design, one of unique features found in any Thermal Combustor Systems is the Turbulating Combustion Chamber. Utilization of these features has paved the way for Thermal Combustor Systems to operate at the lowest temperatures possible while still providing the highest VOC destruction. Faced with today's compliance requirements the old design strategies of time and temperature are not enough. Thermal Combustor Systems meet the world's most stringent emission limits by maximizing turbulent mixing, flame impingement and temperature uniformity we can assure users of low cost and ultra high destruction. The combustion system in all the Thermal Combustor Systems is designed to process your waste stream safely directly as a fuel. This saves in overall size of the system, minimizes supplemental fuel consumption, and makes for a very economical pollution control system. The Process Gas Burner System will safely distribute and inject the gasses into the Turbulating Combustion Chamber. 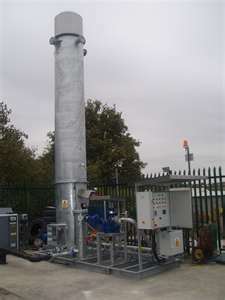 All gas handling equipment, valving, and flame arrestors are designed and supplied to meet the highest safety levels. 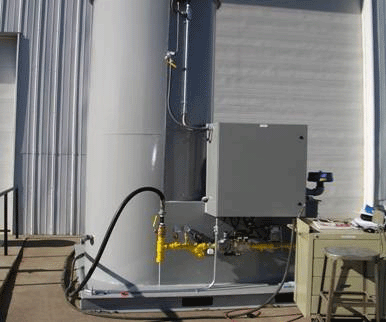 Unlike enclosed flare systems, the TCS process burner is designed to accept ranges BTU concentrations without risk to flame-outs or lower combustion temperatures. All Thermal Combustor Systems utilize a specialized internal insulation system that will retain heat for low cost and cool shell temperatures, while allowing fast startups and extended equipment life. 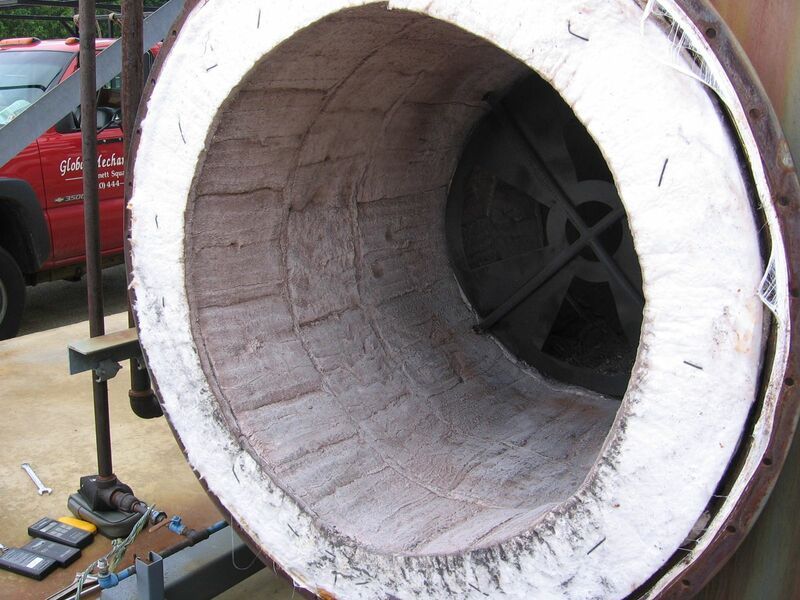 The insulation system works in conjunction with the round design to eliminate fatigue for industry leading uptime reliability and the lowest maintenance costs. 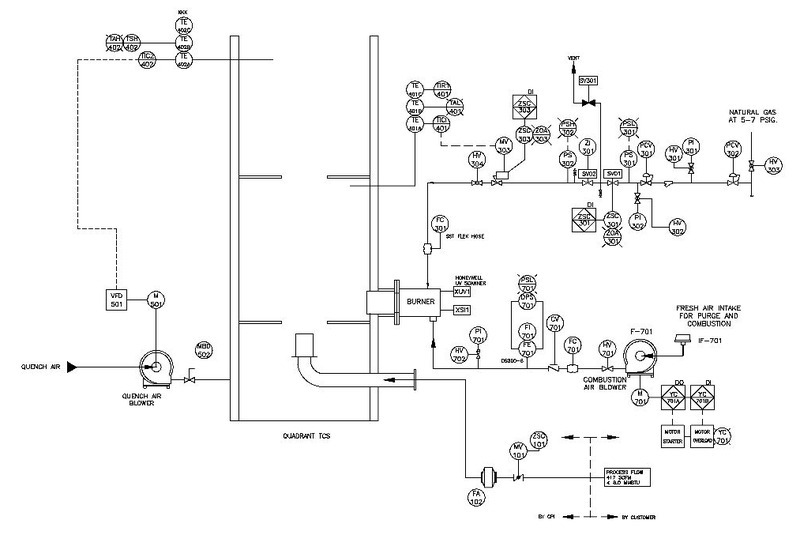 Every Thermal Combustor Systems is integrated with our customized PLC-control panel called TSS. TSS communicates with the TCS and your process for optimal performance, safety, and reliability. TSS optimizes the systems efficiency by managing temperatures, controlling the frequency drive, and positioning valves. This user-friendly system provides automated operations, one button start - stops, self-diagnostics, and data monitoring options for simplified maintenance and compliance verification. Each Thermal Combustor System is shop assembled and in some cases, we can provide factory acceptance testing to speed field installation and commissioning.